filled with a stunning triple flame pattern. 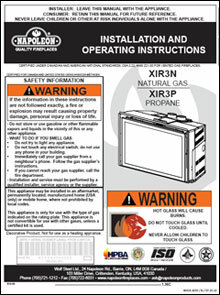 Napoleon’s XIR3 is a deluxe, direct vent infrared gas insert which offers many standard features including a thermostatic remote and an exclusive NIGHT LIGHT™ that radiates a warm glow throughout the room, even when the fireplace is off. The perfect solution for replacing an inefficient masonry or prefabricated fireplace.